Welcome to this week’s edition of The Friday Five! The Friday Five is a feature that I post every Friday in which I give my thoughts on a topic that’s related to NBA Live, NBA 2K, and other basketball video games, as well as the real NBA, and other areas of interest to our community. The feature is presented as either a list of five items, or in the form of a Top 5 countdown. 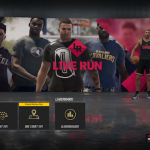 This week’s Five features five tips for being a good online teammate in NBA Live 19’s LIVE Events and LIVE Run. It’s a good time to play The One and its connected modes in NBA Live 19. The latest content update has doubled XP in celebration of the 2019 All-Star Weekend, offering an opportunity to make quicker progress on levelling up your One Player. Beyond that, the developers are keeping things fresh with new LIVE Events throughout All-Star Weekend, and the online team play experience of LIVE Run remains a fun way of hooping it up with your fellow virtual basketball enthusiasts. I’ve been taking part in a few LIVE Events myself this week, both solo and co-op. I’ve generally had a good time playing the co-op LIVE Events in NBA Live 19, but the games have been frustrating at times. Some of my frustration can be attributed to inevitable lag or areas where NBA Live still has room for improvement, but on more than one occasion, I was left muttering and wondering what my online teammates were doing. That’s not to say that I never made a mistake, but I encountered quite a few of the common pitfalls of playing online with random teammates. 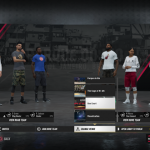 Playing with randoms is never going to be quite the same as running with an organised squad, but here are five tips for functioning as a cohesive unit in NBA Live 19’s online modes. A new official patch/title update (v1.18) has come through for NBA Live 19. It will come through automatically as long as your PlayStation 4 or Xbox One is connected to the Internet. If it doesn’t, try checking for the update manually, or restarting your console. There aren’t any patch notes as yet, but based on a Tweet by the official NBA Live Twitter account, the major updates in Patch 1.18 are new courts for 3v3 LIVE Run. These courts can now be selected by accessing the Change Venue option when creating a new 3v3 LIVE Run lobby. If any further details are made available via a list of official patch notes, I’ll be sure to add them to this bulletin, this Forum topic, and the NBA Live 19 update history in our Wiki. For now, feel free to have your say in the comments section below, as well as join in the discussion in the aforementioned Forum topic. Welcome to this week’s edition of The Friday Five! The Friday Five is a feature that I post every Friday in which I give my thoughts on a topic that’s related to NBA Live, NBA 2K, and other basketball video games, as well as the real NBA, and other areas of interest to our community. The feature is presented as either a list of five items, or in the form of a Top 5 countdown. This week, I’m breaking down what I feel are the five worst parts of playing with randoms online. One of the best parts of modern basketball games is that we’re able to meet up with a bunch of other people we don’t know to play online. Likewise, one of the worst parts of modern basketball games is that we’re able to meet up with a bunch of other people we don’t know to play online. Snarky echoes aside, online gaming will always be a mixed bag, no matter what the genre. Not everyone is about playing fair, or being cooperative. The experience is usually better if you’re teaming up with people that you know, but that isn’t always feasible. That’s when you end up teaming with randoms. Again, this isn’t unique to basketball games, but hoops games present some unique drawbacks. Since there’s only one ball, not everyone can take an active role at all times as they might in other genres, such as a shooter. Everyone is used to being Player One, and is therefore unwilling to defer to teammates they don’t know. In all fairness it isn’t always a nightmare, and it’s better than not being able to play at all, especially with the new restrictions on team Pro-Am. Nevertheless, it’s often a less than ideal basketball gaming experience. Here are, in my opinion, the five worst parts of being in that situation. Episode #260 of the NLSC Podcast is out now! Join Arcane and I as we recap a busy week in basketball gaming news and previews, which included the release of the NBA Live 19 demo. We have our detailed impressions to share with the community, as well as our thoughts on everything that we learned about NBA Live 19 and NBA 2K19 over the past seven days. We have our first hands-on experience with NBA Live 19 following the release of the game’s demo! In our impressions, we break down what we liked and disliked, as well as what’s improved and what still needs improvement. Trailers and developer blogs have given us an insight into what to expect from the extended experience in The One. It’s not the traditional experience we’re still wanting the game to provide, but the additions do look and sound good. The NBA Live 19 soundtrack has been revealed. We’ve given it a listen, and have a couple of thoughts to share. Judging by the NBA 2K19 MyCAREER trailer, this year’s story is going to be a lot better. The ability to skip cutscenes and The Prelude is appealing too, though we still have some concerns. Private matchmaking has been added to Pro-Am in NBA 2K19. We absolutely approve, even if we are a little burned out on the mode. A few snippets about gameplay are being released ahead of the developer blogs, and they do sound quite promising. We wrap up Episode #260 of the NLSC Podcast with our reactions to the impact of Belgian law on MyTEAM, and wonder whether we’ll continue to see changes worldwide. The NBA Live 19 demo will be dropping in less than ten hours, but before then, we have some new information about this year’s game. This insight comes straight from Executive Producer Seann Graddy, in a developer blog posted over on the official website. Changes to 3v3 LIVE Run go beyond the new global courts. Games are now played to 11, with baskets counting for one and two points rather than twos and threes. Hype is intended to set The One players apart from each another, since reaching 99 Overall will be an attainable goal with persistence. Hype has six tiers (Rookie, Pro, All-Star, Superstar, Legend, Icon), with each tier having five levels. Raising your Hype earns new gear, as well as players for your squad and other rewards. You’ll also get a badge displaying your Hype level in online lobbies. 5v5 LIVE Run will be more of a traditional Pro-Am experience, with five minute quarters and full rules, including fouls. It also benefits from the addition of the new global courts. Private games on our One Court will allow for custom rules, including additional points for dunks and layups, and other variations on the Pro-Am format. More rule sets will be added post-launch. Be sure to read the blog for the whole scoop! Feel free to post your thoughts in the comments section below, and join in the discussion taking place here in our NBA Live 19 Forum. Although an official announcement has yet to be made, a few more tidbits about NBA Live 19 have been revealed. The information comes courtesy of Shacknews – who have posted an extended preview of the game complete with raw gameplay footage – and influencers including Will OS and NBA Live Girl. A few other gameplay videos, and videos discussing details that have leaked, have also been posted. 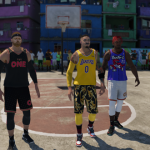 It seems that we’ll be able to create our own custom courts in The One this year, in a manner very similar to the hometown blacktop in NBA Street Homecourt, as well as the custom courts in NBA 2K’s MyTEAM and 2K Pro-Am modes. More details are no doubt forthcoming in an official announcement and preview. Speaking of courts, the video from Shacknews also provides us with as glimpse of the custom Joel Embiid court, which was listed as one of the pre-order bonuses. The video also confirms that quarters have been added to games in The Streets, which were previously all played under the “First to 21” win condition. 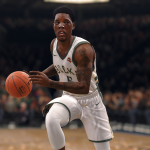 In addition to uncut gameplay, it also provides an overview (and naturally, spoilers) of The Rise, the story that provides the backdrop to The One in NBA Live 19. The hour long video runs from the beginning of the story at Quai 54, through the Draft Combine and concluding at the NBA Draft itself. 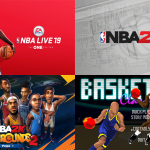 Also of interest, Sports Gamers Online recently had a chance to interview NBA Live 19 Creative Director, Connor Dougan. Connor was actually asked about a PC version of NBA Live, and while he confirmed it isn’t happening this year, he expressed his support for the idea, even mentioning modding. It was cool to hear, so be sure to check out the interview for his full comments! With NBA Live 19 just six weeks away, more information should hopefully be coming through fairly steadily. We’ll certainly try to stay on top of the news, but for now, check out some of the videos below, and feel free to leave a comment with your thoughts. As always, we also invite you to join in the discussion here in the NLSC Forum. 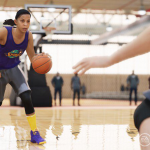 After teasing a special announcement with a short video featuring the Los Angeles Sparks’ Candace Parker, EA Sports has revealed that NBA Live 19 will feature female Create-a-Player functionality. Although the WNBA was featured in its own Play Now mode in NBA Live 18, this marks the first time that NBA Live will allow gamers to create female players. As explained in an article over on Game Informer, female avatars will be playable in LIVE Run, LIVE Events, and The Streets World Tour, using the same progression system as their male counterparts. They will not be playable in The League however, and at this time, there is no equivalent WNBA career mode. Creative Director Ryan Santos has confirmed that it’s something that has been discussed, and may be in the game as soon as next year. 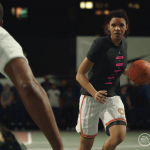 Although there won’t be a dedicated career or season mode for the WNBA, the league’s players will still have a presence in The Streets, along with any female ballers that gamers create. Their inclusion in the mode was hinted at in the very first teaser for NBA Live 19. EA has also released a new gameplay trailer to celebrate the announcement. Watch it below, or catch it here on YouTube. A few new screenshots have been released, which you can also find below. What are your thoughts on the latest development regarding NBA Live 19? Would you be interested in more WNBA content, such as a career or season mode? How is the game shaping up? Have your say in the comments section below, and join in the discussion taking place here in the NLSC Forum. A new patch (1.07) has come through for NBA Live 18. It will be downloaded automatically as long as your PlayStation 4 or Xbox One is connected to the Internet; if it’s not showing up, try restarting your console. Patch 1.07 is a substantial content update, as it not only provides an overdue roster update, but also adds a 3v3 option to Live Run. 3v3 had previously been teased by the official social media accounts, and was more or less officially confirmed yesterday. The latest rosters are accurate as of November 15th. While this date is obviously a week behind, no significant transactions have occurred since then, so the rosters should be more or less accurate. A handful of incorrect jersey numbers have also been corrected. Other key issues addressed by Patch 1.07 include problems with Carmelo Anthony’s jumpshot not unlocking, Reward Crates forcing players to exit online lobbies, and disconnections while navigating The One Store. The patch notes, which you can check out below in their entirety, also mention the usual “general stability fixes and improvements”. As always, feel free to discuss the latest patch in the comments section below, as well as in this topic in the NBA Live 18 section of our Forum. You can also find a full update history for NBA Live 18 here in our Wiki.